The Launch Pad: Happy Birthday NASA! This year is celebrated NASA 50th anniversary... and it seems like Congress decided to give a nice birthday present by passing a bill that could be funding it with $2.6 billions more than what many expected, thus totalizing a $20.2 billions budget for next year! A meaningful analysis is offered by Taylor Dinerman at The Space Review. The Office of Management and Budget is also presenting a breakdown of mandated NASA activities for this budget. Oh et j'allais oublier, pour nos amis français - ou plutôt francophones - voila un lien vers un article en français, intéressant surtout parce qu'il décrit un peu comment le budget se répartit dans les différentes activités de la NASA. "For the first time the bill orders NASA to consider international participation and cooperation, as well as commercial involvement in space exploration activities." "...achieving this vision, Obama will reach out to include international partners and to engage the private sector to amplify NASA's reach." "[NASA] has been working with 13 other space agencies to develop a globally coordinated approach to space exploration; Barack Obama will not only continue but intensify this effort." 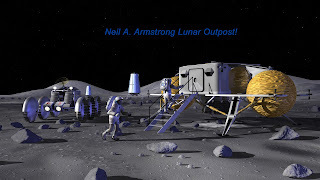 Speaking of the Armstrong lunar base, it would be of great symbolic value to have an Apollo astronaut as a "honorary CapCom" for a key event of the first lunar return mission. For example, he might give the "GO for TLI".